A month ago, the Washington Post published the most insightful article to date on the challenges the U.S. government has encountered battling al Qaeda, the Islamic State and jihadis writ large in social media. The U.S. State Department’s Center for Strategic Counterterrorism Communications (CSCC) has been charged with a mission impossible: countering jihadi sympathies online while also pleasing all critics inside the U.S. government and in the mainstream media. Ten years ago, countering al Qaeda’s narrative largely rested in the hands of the Department of Defense (DoD). Gobs of money were thrown at efforts to discredit Bin Laden and crew. Having supported a few of these programs, I can attest firsthand that they were largely a giant waste of time; their focus was more about pleasing military commanders than actually undermining al Qaeda’s message. The CSCC on the other hand, in concept, remains the correct approach. What more could the U.S. ask for than culturally-informed counterterrorism experts armed with social media, building from lessons learned gained in more than a decade of observing jihadi propaganda? Apparently the system must have zero defects as well. The Washington Post article illustrates the strange position the CSCC remains in. The article discusses how one of the CSCC’s videos gathered more than 800,000 views. This should have been seen as a major success, simply gaining an audience in jihadi online circles is a major first step, but instead those inside government prone to fearful bureaucratic survival immediately started undermining the effort. The CSCC played by the enemy’s rules and lost, not to the enemy, but to their own team. As we approach the fourteenth anniversary of the 9/11 attacks, the U.S. should ask itself whether it seriously has the stomach to counter jihadis on the Internet. For the CSCC or any government effort to be successful in the online space, they must have initiative, flexibility, capacity, autonomy and space for experimentation. Bureaucrats, media critics, and counterterrorism pundits are unlikely to provide these things to an operation like the CSCC. Where do you want to counter violent extremism? There are three fronts in countering jihadis flowing into ISIS: 1) The Middle East, North Africa and South Asia (MENASA) 2) Europe 3) North America. These three fronts, in order, provide different percentages of fighters into ISIS ranks and depending on where they are located, are brought into ISIS through differing combinations of on-the-ground and online recruitment efforts. Who do we want to counter? Which extremists do you want to counter? Extremists supporting ISIS come in many different shapes and sizes. Will McCants provides the best spectrum for identifying where to focus CVE efforts. I would recommend focusing on those already “radicalizing” to join ISIS. How do you want to counter extremists? As I argued at length in past Geopoliticus posts, the U.S. has largely used the wrong messages, messengers, medium, and method to counter the bulk of those radicalizing to join ISIS (i.e., moderate voices and community engagement). Instead, I proposed using a different message more effective for the radicalizing target audience and in particular a more effective messenger: defectors from ISIS ranks. Having read about the struggles of the CSCC, I would like to take these questions a step further today and describe how I would recommend doing a more effective counternarrative program. As I discussed previously, CVE efforts should start online rather than on-the-ground. Online efforts cut across all three theaters of foreign fighters being recruited to ISIS (MENASA, Europe & North America) and when done properly will illuminate the hotspots where on-the-ground CVE efforts such as community engagement and promoting moderate voices can be applied more effectively. Pinpoint Vulnerable Audiences: Identify those radicalizing online communities of ISIS enthusiasts most attracted to ISIS content. Folks like J.M. Berger have already done the lion share of this work (just watch his Twitter feed and read his book). Social media companies who’ve finally conducted waves of shut-downs on ISIS accounts should be able to provide even greater fidelity on where those ISIS digital enclaves reside and further describe the proclivity that these accounts have for ISIS material. This refined data would further enable the crafting of a precise counter narrative. Tentative Title: “Bandit” – AQIM’s fracturing, infighting and criminality as they are overrun by French forces in Mali. Tentative Title: “Ansaris & Muhajirs” – al Shabaab’s killing off of their own foreign fighters and clan based infighting inside the group. Each of these movies would be provided in different languages to more directly appeal to specific radicalizing audiences and they would illuminate several themes of folly and despair encountered by actual foreign fighters embroiled in these jihads. 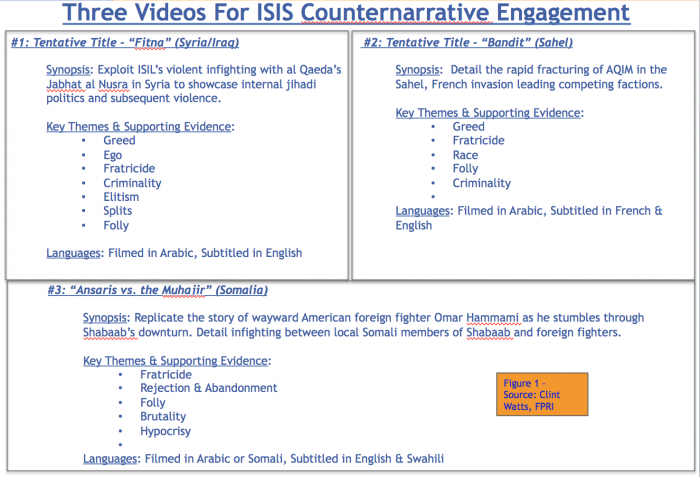 The scripts for these three videos would not be propaganda as the content is already written by jihadis who’ve spilled their betrayals online (Omar Hammami’s biography writes its own screenplay). Each movie would be roughly 60 – 80 minutes in length, but told in chapters of 5 – 10 minutes suitable for dissemination in a serial trough YouTube and other video hosting sites. Each of the videos would follow a similar build up as well (See Figure 2). The videos would need to appear, in at least the first three episodes, to be somewhat sympathetic to joining a jihad – tracing the introduction, immersion and initial reception of a foreign fighter. After three episodes, dreams of jihad glory would fade as softer themes undermining ISIS enter the storyline–foreign fighters participating in criminal activity for example. As the story continues, the video would shift to real stories of horrid ISIS behavior–barbaric torture, sexual enslavement, killing of innocent women and children. The video series would conclude with a foreign fighter watching the fratricidal killing of a fellow foreign fighter at the hands of a corrupt jihadi leader. The foreign fighter would manage to defect from ISIS to return home, finding he had shamed his family. Host and disseminate the videos: The video chapters would be released one per week. After release of the tenth episode, the entire movie would be hosted in multiple locations in the jihadi online environment (i.e. YouTube, etc.). The videos would then also link to the actual documentary interviews of real foreign fighters that have traveled the journey of the foreign fighters described in the telenovela serial. The internal documents of al Qaeda, ISIS, AQIM and other terror groups detailing internal conflict and deceit (i.e., Harmony Documents, Bin Laden’s Bookshelf, etc.) would also be linked to these videos so that those on the radicalization path can see for themselves the disingenuous nature of all these jihadi campaigns. The hosting locations would allow for comments and debate, further refining the application of other CVE programs. These online debates along with standard social media viewer metrics would provide the basis for true measurement of online CVE efforts. 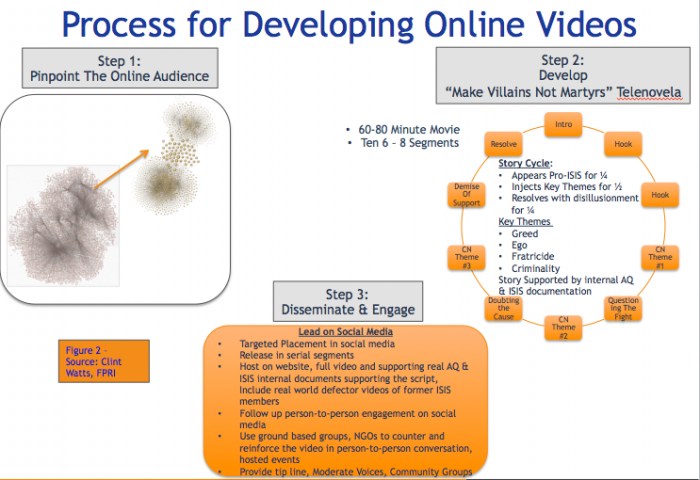 Follow up with on-the-ground CVE efforts: Effectively engaging in the online space with these videos would reveal hot spots where other CVE efforts can be employed more effectively. Those jihadi digital enclaves most engaged on ideological issues would be ideal for a “Moderate Voices” CVE efforts and some physical communities might also surface appropriate for the application of CVE community outreach programs. Essentially, the videos will act as blood in the water for jihadi sharks. Engagement, regardless of whether its positive or negative, will illuminate what we currently cannot see–the fault lines in ISIS popular support that we need to exploit. Ultimately, this type of a program will likely not make it out of the concept phase. It will be plagued by interagency infighting and will take so long to produce through the U.S. bureaucracy it will be available right about the time ISIS collapses. In actuality, an online defector video series like this would not take that much time or resources to execute. The scripts are practically written and the production will be more effective and efficient if done in the Middle East or North Africa. (Off the cuff, I’d recommend looking first at Morocco, Jordan and Lebanon for video production–they’ve got some good capacity.) The online analytics, hosting, and dissemination can all be done from a few laptops armed with a couple credit cards. So again I ask, do we really want to do online CVE? It seems the CSCC can do it, but will we let them? This post was originally published on Foreign Policy Research Institute’s Geopoliticus Blog. Cross-posted here with permission.